In both routes the process consists of producing refined iron to which is added the required alloying elements to produce the finished steel specification. Their respective shares in crude steel production are 70% (BOF) and 30% (EAF). High production rates and low impurity steel production give a dominant role to the first process route. Low energy costs and an ample supply of recycled scrap ensure a competitive market share for the second process route, especially when using the UHP furnace. Before casting, the steel can be refined in the ladle by various processes according to the specification with respect to its deoxidation state, inclusion content and level of phosphorus, sulphur, nitrogen and hydrogen. At the same time, its content of carbon, manganese and microalloying elements such as niobium, vanadium and titanium can be adjusted. This process step is generally referred to as Secondary or Ladle steelmaking. During the last step of steelmaking, the steel is cast either into slabs, blooms or billets on a continuous casting machine or into ingots, depending on the final product. 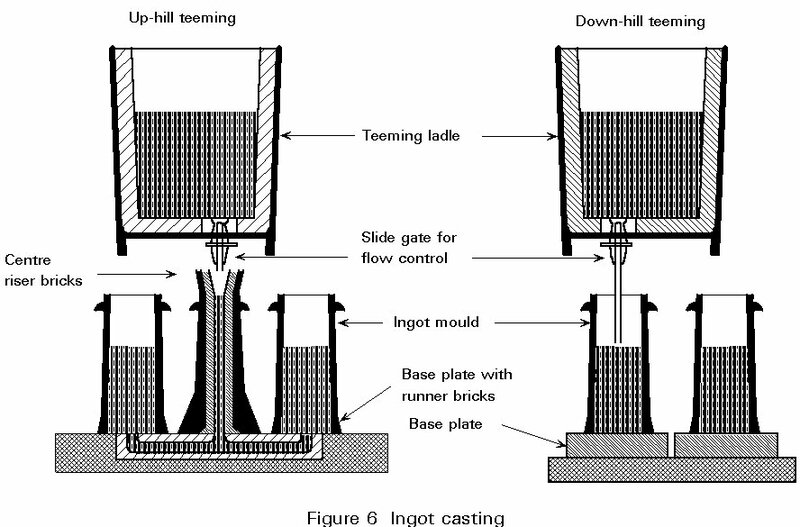 Flat products and light shapes are normally produced from continuous cast feedstock, whereas heavy beams and plates are more likely to follow the ingot route. Sintered iron ores are reduced to raw iron in the blast-furnace. 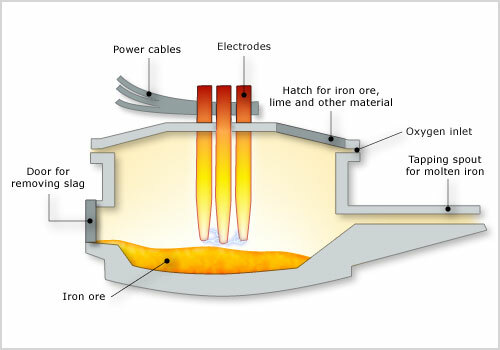 The raw iron is then transformed into crude steel in the oxygen converter. As this operation yields energy, additional scrap is introduced in order to control temperature. The iron feedstock of the blast furnace is the sinter, which is produced in the sinter plant. In the sinter process, a mix of iron ore fines, lime and coke (almost pure carbon) is charged in a 45 cm thick layer onto a moving conveyor (Dwight Lloyd process) and partially melted to form a porous mixture of iron oxides and gangue. Coke consumption is about 50 kg/t sinter product. 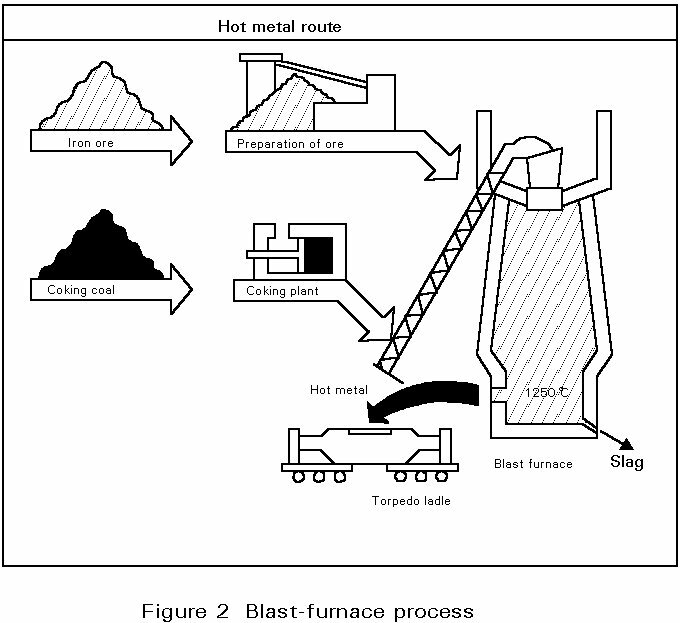 The blast-furnace is a shaft type furnace operating by the counterflow technique : the descending burden of sinter and coke, charged from the top of the furnace, is heated and reduced by the combustion gases ascending from the tuyere zone where a hot air blast is injected to burn C to CO. The air blast is compressed by a blower and heated in special stoves to 1100°C by combustion of the cleaned furnace exhaust gases. The iron oxides (FeO, Fe2O3) and some of the elements present in the gangue of the sinter are reduced by CO gases to produce hot metal. 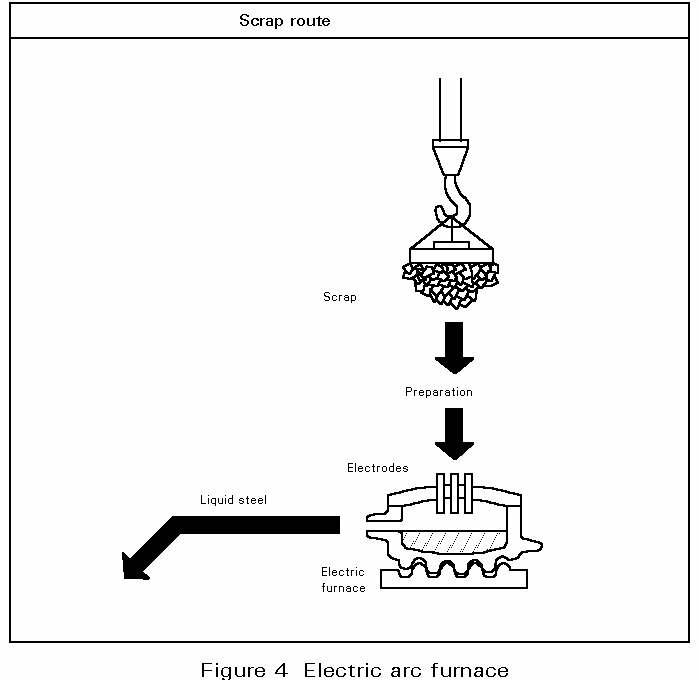 The blast furnace flue dust containing about 40% Fe is recycled by the sinter process. The high permeability of the sinter and the even distribution of the charge produced by revolving chutes help to improve productivity of the blast furnace. Coke consumption can be reduced to 470 kg/t of hot metal. The use of tuyere injectant such as powdered fuel (120 kg/t) or oil (60 kg/t) further reduces the coke consumption of the furnace and so the cost. Below the tuyere zone, where the temperature is highest, the molten material collects on the furnace hearth where the liquid iron (pig iron) separates from the slag by difference in density. The slag and liquid pig iron are tapped from separate tapholes. The tapped slag is granulated by water jets and removed for use in other products including road construction materials, fertilizers, etc. The liquid pig iron (hot metal) is tapped into ladles or torpedo cars (capacity: 300 - 400 t) and conveyed to the steel plant for refinement and conversion into steel. 4,7% carbon (C); 0,5% manganese (Mn); 0,4% silicon (Si); 0,1% phosphorus (P) and 0,04 % sulphur (S), the remainder being iron (Fe). Sulphur removal from the melt needs low oxygen activities. Desulphurization is therefore achieved in the hot metal by injection of calcium carbide fluxes to form calcium sulphide (CaS) or fluxes containing metallic magnesium to form MgS and CaS. 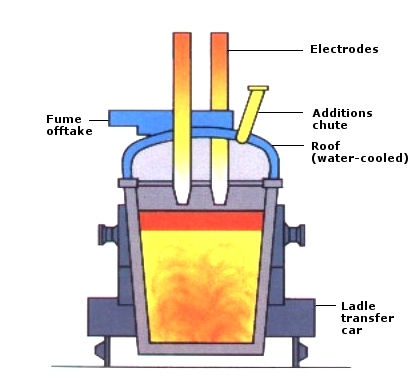 The basic oxygen furnace or LD converter (originating from the Linz-Donawitz process started in 1956) is based on oxygen injection by a lance into the melt of hot metal. Scrap and lime are charged into the converter to cool the melt and remove phosphorus, silicon and manganese. The converter is lined with dolomite or magnesite refractory which best resists erosion by slag and heat during oxygen blowing. The life of a converter lining is about 800 to 1400 heats. The oxygen burns out the carbon as carbon monoxide CO and carbon dioxide CO2 gas which is collected in the chimney stack and cleaned of its dust (Fe203, and lime particles, etc.). The elements Mn, Si and P are oxidized and combine with lime (CaO) and FeO formed by the oxidation of Fe to form a molten slag. As these oxidation reactions are highly exothermic, the process needs cooling in order to control the temperature of the melt. This cooling is done by charging scrap (recycled plant and mill scrap) and by adding iron ore during the blowing process. The oxygen blowing takes 15 to 20 minutes, regardless of the size of the converter (70 to 400 t) because the oxygen flow rate of the lance is adjusted to the melt weight. The charging and discharging of steel and slag, including sampling for temperature and analysis of the melt, extends the tap to tap time of a converter to 40 - 60 minutes. The process is characterized by high productivity and steel of low impurity content. The steel is tapped to the ladle through a taphole by tilting the furnace. 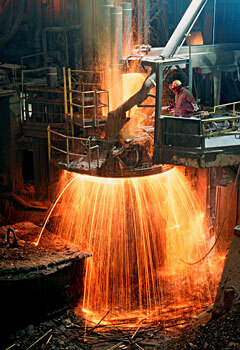 During this operation ferro-alloys for control of the steel composition are added to the ladle. The oxidized slag containing 12 to 16% of Fe is poured into a cast iron slag pot after the tapping and is disposed of in a slag yard. 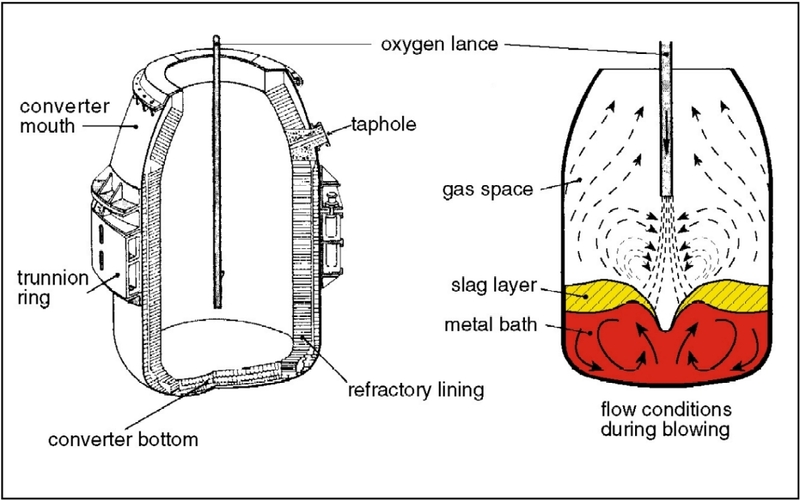 A major development in the oxygen lance blowing technique, known as Lance Bubbling Equilibrium (LBE) was developed in the mid-seventies and has been widely adopted. 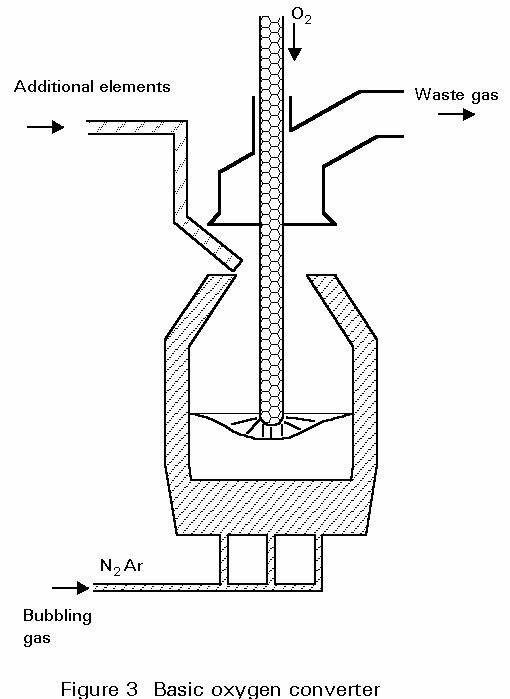 Neutral gas, typically argon, is injected through permeable elements in the bottom of the converter, stirring the melt and slag. This significantly increases metallurgical efficiency (lower Fe losses and lower P content), productivity, and the heat and mass-balance of the process (cost reduction). In the electric arc furnace process, the cold metallic charge, mainly scrap, is melted by the energy of electric arcs generated between the tips of graphite electrodes and the conductive metallic charge. The three electrodes and the furnace roof are raised and swung away from the furnace shell to allow the charging of scrap. The electrodes maintain the arc in accordance with the voltage and current level selected to produce the desired power input at the desired arc length for melting and refining. As the noise generated by the arcs is high during the melt-in-period, with levels up to 120 dBA, special protection is provided to the operators cabin and the furnace has a special enclosure. The three phase alternating current is supplied by the low voltage side (300 - 700V) of a high power transformer. The nominal transformer rating, expressed as KVA/t, extends from 300 to 500 KVA/t for high power furnaces and from 500 KVA/t upwards for Ultra High Power (UHP) furnaces. 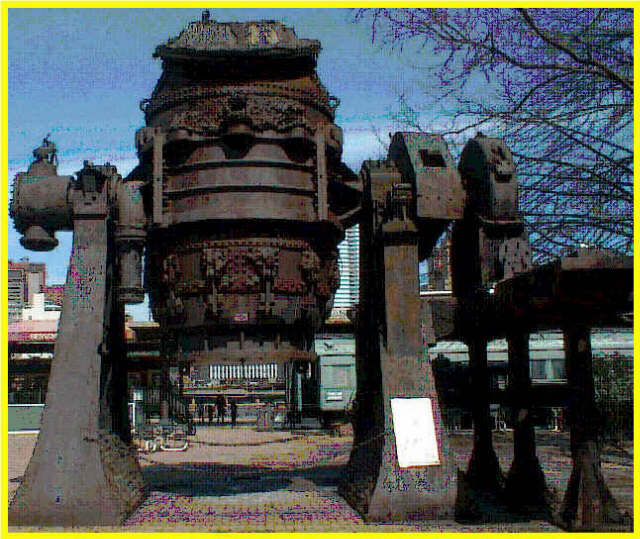 These furnaces have an inner diameter of 6 to 9 metres with a capacity of 100 to 200 tons of steel. The tap-to-tap time for these furnaces is 90 to 110 minutes. The traditional role of the EAF process is producing alloy, tool and carbon steels, and it has been extended by the UHP furnace to mass steel production. Thus, the concept of the Mini-Mill was born. As the size and productivity of the furnace increased, the operation of continuous casting for billet and bloom production became possible. Flat products specification, however, require low residual impurity levels and even higher production rates which cannot be satisfied by the UHP-furnace. The share of steel production produced by electric arc furnace is about 30%, at which level it seems to be stabilized as scrap of acceptable quality becomes more scarce. Pellets and sponge iron of higher price have to be used for critical steel grades to control the level of injurious elements, i.e. copper, nickel, tin, etc. The traditional high power furnace produces high quality carbon and alloy steels by the two slag technique. After melt down of the scrap charge, a first oxidizing slag removes the elements P and Si and reduces carbon to the required level. After deslagging, a second basic reducing slag is formed to lower the sulphur and oxygen contents and the steel composition is adjusted by ferro alloy additions. The UHP furnace operates with only a lime based oxidizing slag. The melt down of the scrap charge is accelerated by the use of oxy-fuel burners positioned to reach the cold spots of the large hearth furnace. Oxygen lancing and carbon additions are used to make a foaming slag which yields better energy input from the arcs and improves dephosphorization. After this period, the melt is discharged by a taphole. 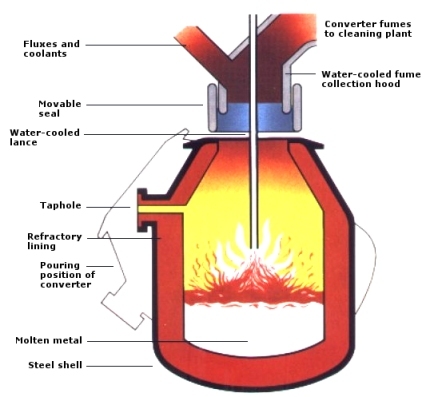 Deoxidation and refining under reducing slag takes place in the steel ladle (secondary steelmaking). The 100% scrap charge makes the process more vulnerable to injurious “tramp elements“, such as copper, nickel and tin which cannot be removed by the process, their stability being higher than that of iron. To control these “tramp elements”, it is of great importance to identify the sources of the incoming scrap and to make provision to keep the different qualities separate. Achieving the required properties of steel often requires a high degree of control over carbon, phosphorus, sulphur, nitrogen, hydrogen and oxygen contents. Individually or in combination, these elements mainly determine material properties such as formability, strength, toughness, weldability, and corrosion behaviour. 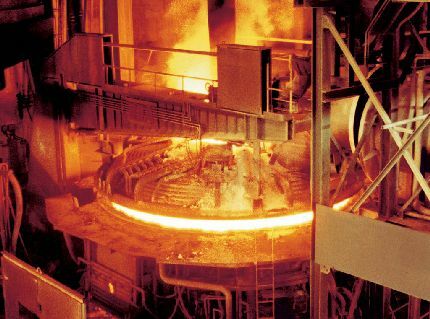 There are limits to the metallurgical treatments that can be given to molten metal in high performance melting units, such as converters or electric arc furnaces. The nitrogen and phosphorus content can be reduced to low levels in the converter but very low carbon, sulphur, oxygen and hydrogen contents (< 2 ppm) can only be obtained by subsequent ladle treatment. To ensure appropriate conditioning of steel before the casting process, the alloying of steel to target analysis and special refining treatments are carried out at the ladle metallurgy stand. hydrogen removal to very low levels by vacuum treatment. The high oxygen content of the converter steel would result in large blow-hole formation during solidification. 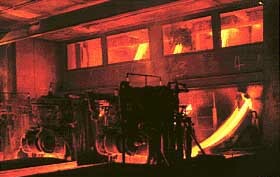 Removal of the excess oxygen (“killing”) is therefore vital before subsequent casting of the steel. 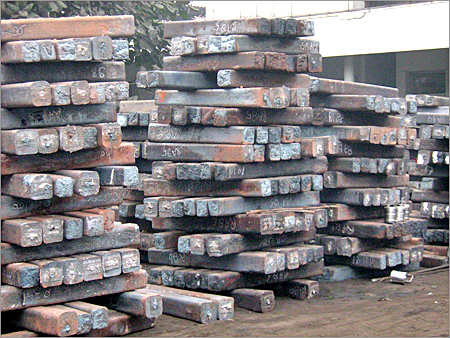 Steels treated in this way are described as killed steels. 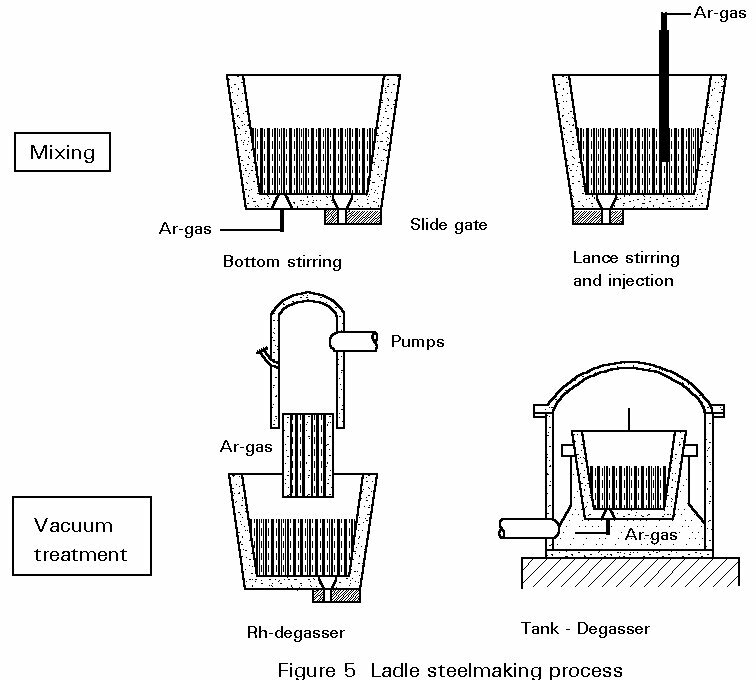 All secondary steelmaking processes allow deoxidising agents to be added to the ladle so that deoxidation in the converter vessel is not necessary. Deoxidation can be performed by the following elements classified by increasing deoxidation capacity : carbon - manganese - silicon - aluminium - titanium. The most popular are silicon and aluminium. After addition, time must be allowed for the reaction to occur and for homogeneity to be achieved before determination of the final oxygen content using EMF probes (electro-chemical probe for soluble oxygen content). High temperature losses (50 - 100°C) are a disadvantage, therefore high superheat of the melt prior to this process is essential. 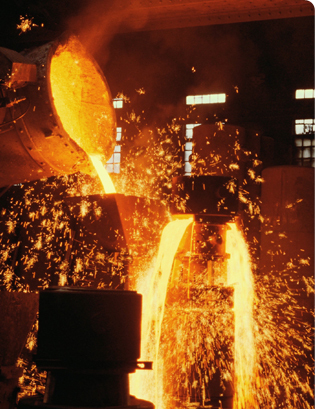 For most secondary steelmaking techniques it is either desirable or essential to stir the liquid steel. Gentle stirring is sufficient for inclusion removal; non-metallic inclusions are brought into contact with liquid slag on top of the melt where they can be fixed. 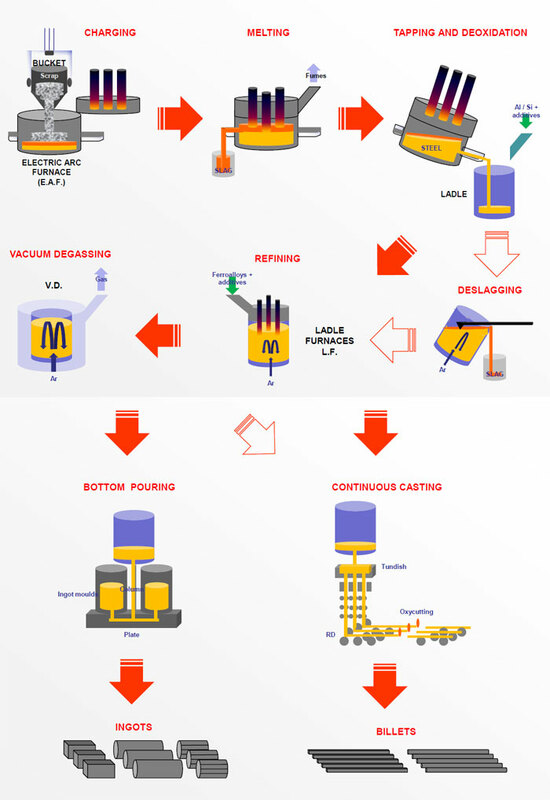 For degassing and desulphurization however, violent stirring is necessary to increase the surface of steel exposed to vacuum (H-removal) or to mix the steel and slag for good desulphurization efficiency. For solidification, steel is cast into moulds either of cast iron for the ingot casting route or into copper moulds for the continuous casting process. The heat of liquid steel is extracted by the cold mould surface so that crystals can form and grow. 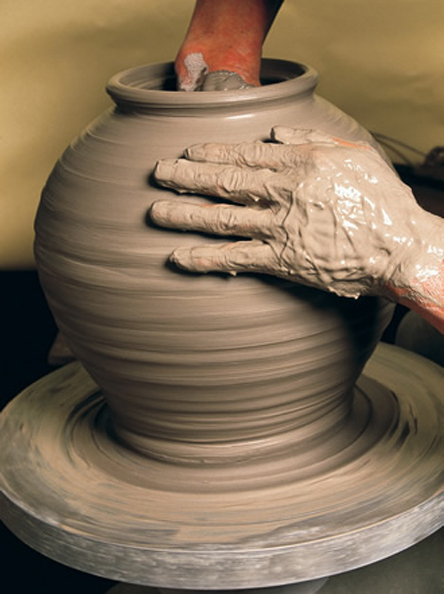 A solid shell is formed and solidification progresses by maintaining the cooling. During solidification, the density of metals rises and causes shrinkage. This favours the stripping of the cast from the mould. However, this contraction also causes internal shrinkage which tends to leave a hollow core in the cast product. In continuous casting this is prevented by the continuous flow of molten metal to the mould. For ingot casting an adequate liquid metal pool has to be maintained at the head of the mould by the provision of exothermic material (hot-top). A second concern during the solidification process is segregation due to the fact that some solute elements have a much lower solubility in the solid than in the liquid phase. The segregation tendency is most pronounced for sulphur, phosphorus, oxygen and hydrogen. As has been described, these elements can be controlled to sufficiently low levels by the metallurgical process steps. The manganese content of steel also combines with sulphur to form manganese sulphide inclusions which are elongated during rolling and become detrimental to steel properties if significant stresses are applied perpendicular to the rolling direction. For such applications, shape and content of the sulphide inclusions have to be controlled closely during the refining stage. 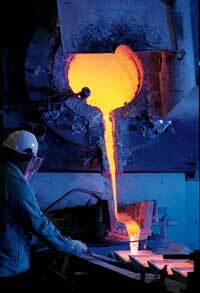 The casting of ingots is a discontinuous process in which the ingot moulds are filled individually by top pouring or in batches by a central feeder through runners in the base plate. This up-hill teeming technique is characterized by a low rising speed of the steel in the mould, which reduces cracks and surface defects when casting critical steel grades. The teeming operation is done directly from the steel ladle through a sliding gate valve at the bottom that regulates the steel flow, and a nozzle that gives a concentric steel jet. The ingot weights and sections are fixed by the capacity of the primary rolling mill. The ingot size may vary from 4 to 30 t, or even higher for forging. The ingot remains in the mould until solidification is complete. Then the mould is stripped off by crane and left to cool in the mould yard. 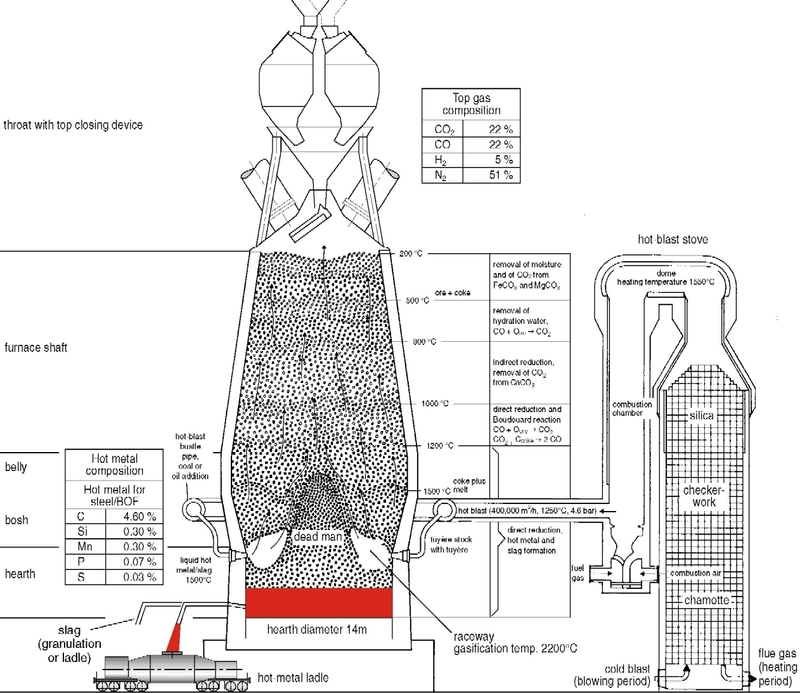 The ingot is charged into the soaking pit furnace to equalize and raise the temperature for the rolling process (» 1300°C). The solidification of an ingot progresses from the bottom (cooled by the base plate and the mould) to the top of the ingot. In the case of a fully killed (Si + Al) steel melt, with a low free oxygen content, the solidification shrinkage is concentrated at the upper centre of the ingot. To minimise the development of shrinkage porosity in this region, the top of the ingot is insulated (hot top) to provide a reservoir of liquid metal to fill up the hollow core. The hot top is subsequently cropped. This scrap amounts to approximately 12% of the ingot weight. For solidification, steel is cast into moulds either of cast iron for the ingot casting route or into copper moulds for the continuous casting process. By deoxidation with silicon alone, the free oxygen content of the melt can be set to a well defined level so that towards the end of solidification it will react with the carbon of the melt to form CO gas. The formation of these small gas bubbles, or blow holes, compensates for the shrinkage of steel and top crop losses are small (» 2%). The blow-holes are eliminated during primary rolling. 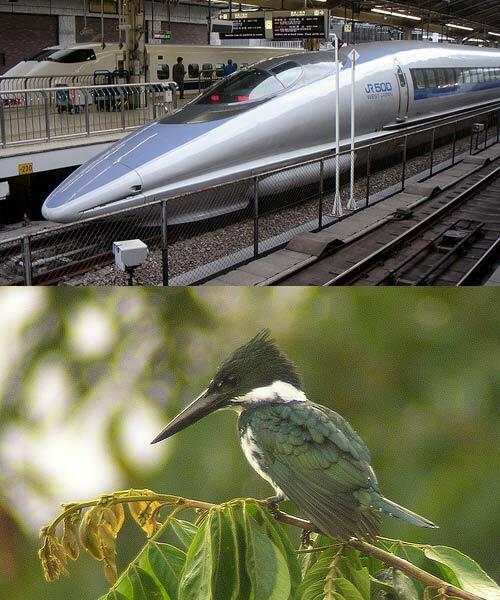 Such steels are referred to as ‘balanced’ steels. Ingot casting is very flexible as regards product specifications and the production of small orders on relatively short delivery terms. It is also indispensable for the forming of heavy shaped profiles like beams, heavy plate or heavy forging pieces. 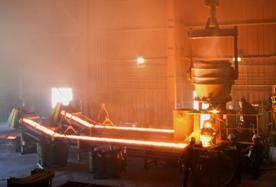 The continuous casting process has become the major casting technology for steel plants. The ratio of continuous cast steel has reached 80 - 90% of total raw steel production in the Western World. The advent and rapid growth of mini-mills could not have occurred without continuous billet casting technology. The essential feature of the continuous casting process is the oscillating water-cooled copper mould. The main function of this mould is to form a solidified steel shell having sufficient strength to prevent breakouts below the mould. 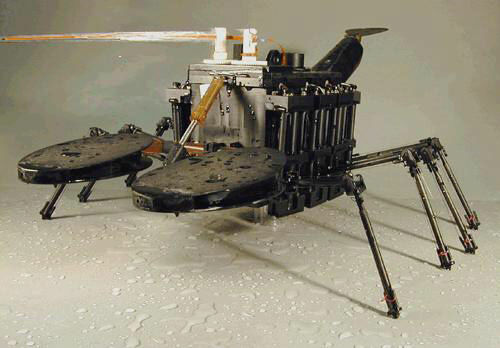 This is achieved by the high heat extraction in the mould system. The mould walls are tapered to accommodate the strand shrinkage over the mould length of 700 mm and to maintain a high heat flux. The oscillation creates a relative movement between strand and mould, and prevents metal sticking to the mould surface. Stripping is facilitated by providing an adequate lubricant (casting powders or oil) at the steel meniscus. This lubricant is also essential to maintain a high heat extraction and prevent breakouts. On leaving the mould, the strand is cooled by water sprays and is supported by rolls to prevent bulging until solidification is complete. Strand sections cover the range of semi-finished products, such as billets, blooms or slabs, for the hot finishing mills. 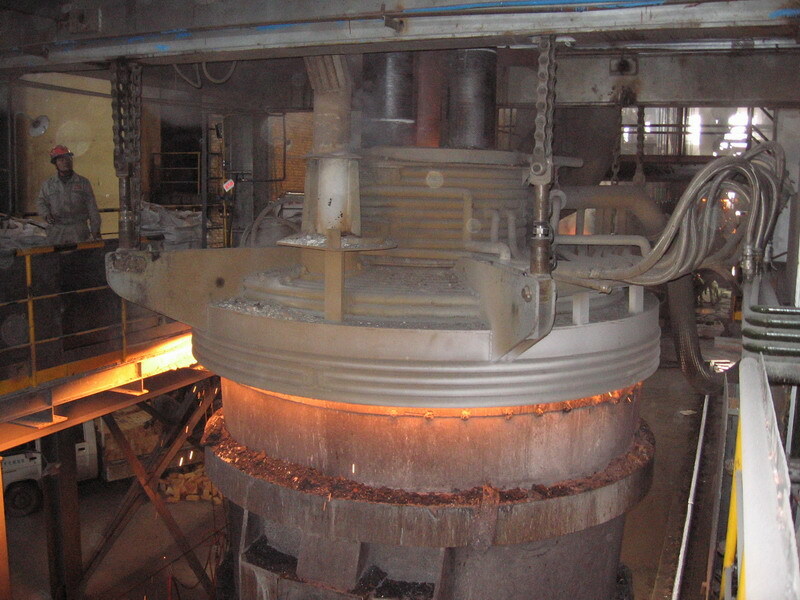 Depending on the section to be cast, a continuous caster is laid out with two (slab), four (bloom or round caster) or six strands (for billets below 180 mm2 in size). Modern casters are curved type machines which are cheaper and easier to accommodate in the plant than the original vertical machines. The curved strand is straightened by rollers after complete solidification and cut to the required length for further processing in the rolling mills. Continuous casting technology makes the process continuous so that a number of molten steel batches are cast in sequence. To achieve a continuous supply of steel to the mould, the steel in the ladle is first cast into a tundish which acts as a reservoir during ladle changing and distributes the steel to the different moulds of the machine. 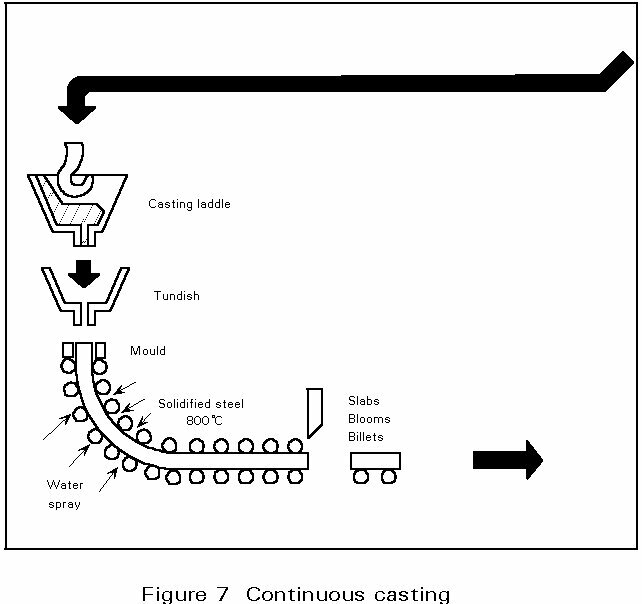 Tundishes are equipped with stoppers or sliding gates to regulate the flow rate to the casting speed of the strand. To prevent oxidation by air exposure, the ladle and tundish streams are shrouded by refactory tubes. The Making, Shaping and Treating of Steel Edited by Harold E McGannon USS (United States Steel) 10th Edition Published 1985. Brockenbrough, R. L., Metallurgy Chapter 1.1 Constructional Steel Design, an International Guide, 1992. Alexander, W., Metals in the Service of Man, Penguin Books, London, 1989. 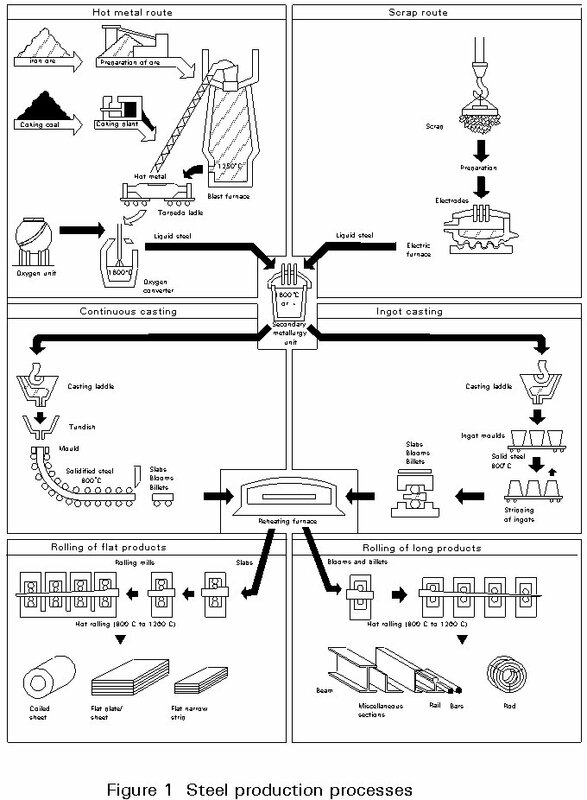 Tamura, I, Theromechanical Processing of High Strength Low Alloy Steels, Butterworths, 1988.